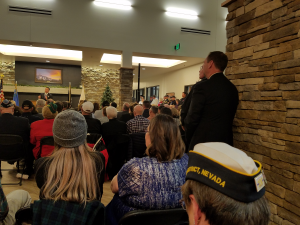 WAVE Board Members Darrell Brown and Gerry Wright had the honor of attending the Ribbon Cutting Ceremony last night (December 17, 2018) at the new Northern Nevada State Veterans Home, 36 Battle Born Way, Sparks, NV. Also in attendance from WAVE was Gold Star Mom Sally Willey and her husband Michael. 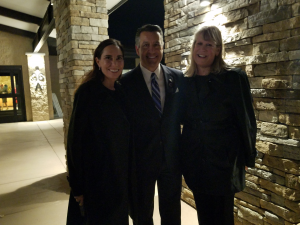 The Keynote Speaker was Governor Sandoval. 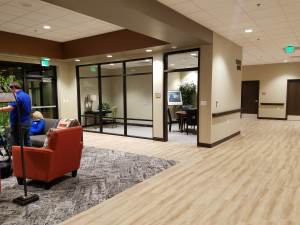 Quality Care and Just Like Home…. 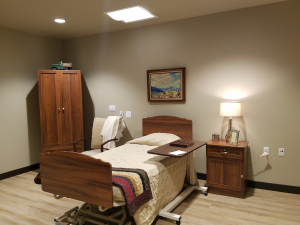 “The design and concept of the Northern Nevada State Veterans Home is like no other. 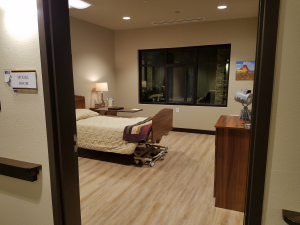 While it will offer the highest level of skilled care, it will never feel like a hospital or institution. 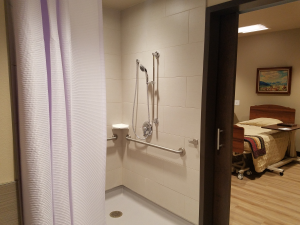 When it’s complete, the 102,000 square foot facility will have 96 beds and feature a host of amenities. 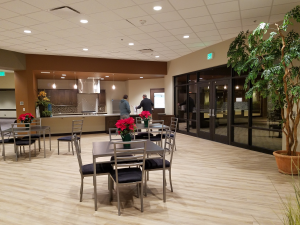 Veterans will have their own private room and share a den, living room and kitchen with 15 other residents. 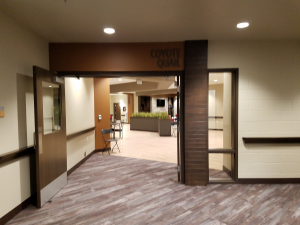 Some construction is still going on and the facilities will start accepting applications in February of 2019. 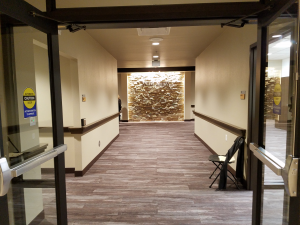 They plan to have everything completed and all certifications done and ready to open in the Spring of 2019. 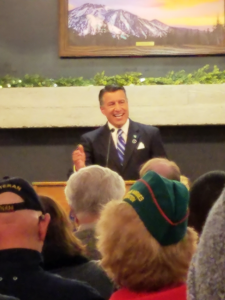 For more information please go to the State of Nevada, Department of Veterans Services website that is shown above. This is a dream of love that has taken almost 20 years to become a reality. 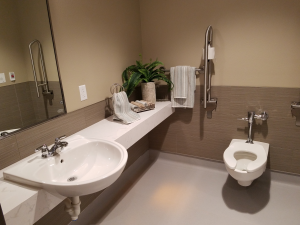 Here are a few more pictures, which is all from the long term care wing. As for me, I can’t wait to see it finished. 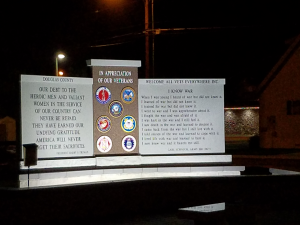 Welcome All Vets Everywhere, Inc., (WAVE), is eager to have the public attend the dedication ceremony for the new Veterans Appreciation Monument tomorrow, Saturday the 6th of October at Noon. 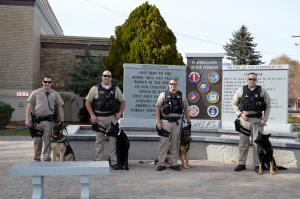 The monument honors the service and sacrifice of living and deceased veterans in Douglas County, and all of Nevada. It has been erected in front of the historic old courthouse on Eighth Street and Esmeralda in Minden. 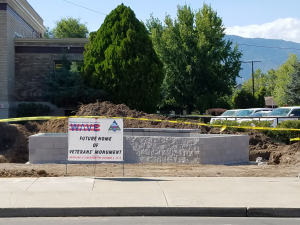 WAVE has been working for almost 2 years with Douglas County Commissioners, local businesses and volunteers to create the monument. A unique part of the monument is that it is also including the National Guard emblem and, more importantly, the Merchant Marine emblem honoring all those that served during WWII, many lost their lives, as an integral part of helping support the war effort. 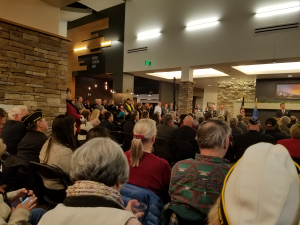 “Our intent is to recognize and pay tribute to the courage, commitment and sacrifices of the veterans, and their families, who reside in the county,” said WAVE President Carl Schnock, a Vietnam Veteran. According to the last census there are about 5,600 veterans currently living in Douglas County. 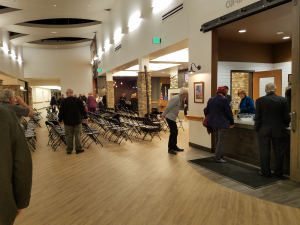 “We are deeply grateful to the generosity of so many local companies, especially major donors like Starbucks and Cristek Interconnects Inc., as well as organizations and individuals who have helped make the monument a reality,” Schnock said. The monument features medallions signifying all branches of the military. 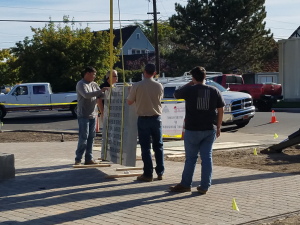 A walkway of bricks can be purchased to honor specific veterans, or individual or family names, or whatever people feel is appropriate to honor and support those that have given everything to protect and defend this nation. The engraved 6X8 inch bricks can be purchased for $100 each and can include up to 4 lines with 12 characters per line. Anyone interested in purchasing a brick or donating to the monument, or WAVE, can go to the “DONATE” button and to purchase a brick just download the Buy-A-Brick form, fill it out and mail it in. All donations can be made by just clicking on the appropriate DONATE button. All donations are tax deductible and are used to help veterans. Haven’t placed any new news in a little over a week because nothing really new was taking place at the construction site. Checked on the site on Friday evening and still nothing really new. 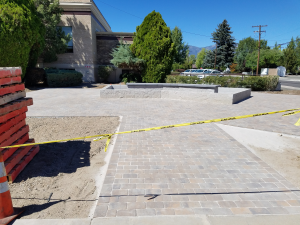 Then, this morning I received an email from our treasurer and sure enough when I went out the pavers had been placed and things are really starting to to take shape. Not sure if all the pavers have been placed as yet since there are still 4 more pallets of pavers sitting there. So, they have filled the interior of the monument with the large gravel and now the pavers are being placed. The monument itself is expected to be delivered on/about September 20th. 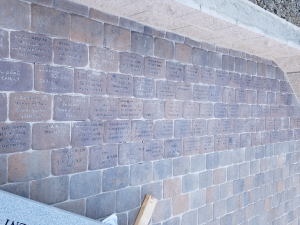 We are also currently having the first 88 pavers, that folks have ordered, inscribed and will hopefully pick those up and start placing them next week as well. 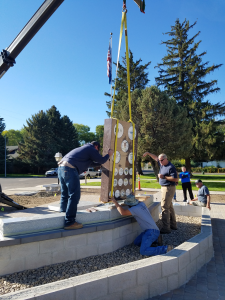 When the monument is delivered it will go directly to the Douglas County warehouse were the preparation for its placement on the top/center piece will begin. Once installed it will immediately be covered until the unveiling on October 6th at Noon. I do not know about any of you, but we here at WAVE are getting very excited. It is hard to believe that almost 2 years worth of work are almost at an end. BUT DON’T WORRY……..your folks at WAVE are already working on another major mission which they will announce to everyone after October 6th…..or maybe that day? You will just have to wait and see. Our next posting will not be until something really noticeable happens so look for something next week (about the 26th) for new pics and a little about what will happen on the unveiling day. Be back soon! We are getting closer everyone. I don’t know about any of you but I am starting to get very excited after almost 2 years of everyone putting this together. Can you picture what it is going to look like?…….. 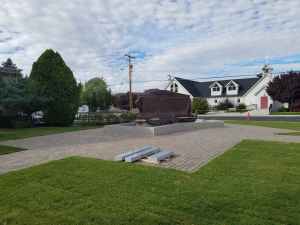 The area around the center will be filled with large gravel and as soon as the monument arrives, the contractors will take the measurements from the base of the monument, and then start drilling into the top cap of the center piece to insert metal posts that the monument will sit on. 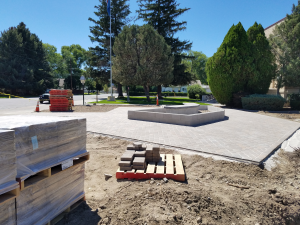 Then it will be time for the landscapers to come in and finish everything out, including the brick pavers being placed around the monument. 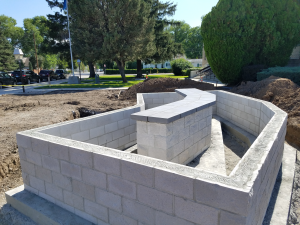 Last Thursday we delivered 70 orders to start the brick inscriptions and we will do everything in our power to make sure that they are placed prior to the dedication on October 6th……..can’t make any promises since we are getting to close. I can tell you that to date, we have almost 80 orders for bricks…..get them orders in everyone. Hope ya’ll are having a great Labor Day Weekend. 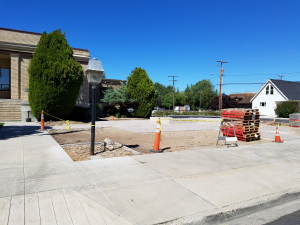 This will be it for the updates until we see a major change…..such as placing the monument or the landscape starting to be done, but we will be back and hopefully with a video interview with Jim Madsen and John Milazzo explaining what is happening and why.